Summary: Just where are we in the Age of AI, where are we going, and what happens when we get there? When things are changing fast, sometimes it’s necessary to take a step back and see where you are. It’s very easy to get caught up in the excitement over the details. The individual data science technologies that underlie AI are all moving forward on different paths at different speeds, but all of those speeds are fast. So before you change careers or decide that your business ‘needs some of that AI’ let’s fly up and see if we can make out a larger pattern that will help us understand where we are and where we’re going. We tend to think of AI as something new, particularly new technologies and techniques linked for example to deep learning. However we’ve been pursuing AI for decades and it seems illogical to exclude our past successes just because the technology has evolved. Launchbury’s explanation helped me greatly but while the metaphor of ‘ages’ is useful it creates a false impression that one age ends and the next begins as a kind of replacement. Instead I see this as a pyramid where what went before continues on and becomes a foundation for the next. This also explicitly means that even the oldest of AI technologies can still be both useful and are in fact still used. While our ability to utilize machine learning statistical algorithms like regression, SVMs, random forests, and neural nets expanded rapidly starting in roughly the 1990’s the application of these handcrafted systems didn’t entirely go away. Only recently Launchbury speaks of the successful application of one such system in defending against cyberattacks. And prior to about 2004 similar systems were actually at the heart of early autonomous vehicles (which largely failed as the rules didn’t account for all the variations in the real world). This second age is where we find ourselves today. While Launchbury tends to focus on the advances in deep learning, in fact this age has been with us for as long as we have been using computers to find signals in the data. This began decades ago but gained traction in the 90’s and continued to expand with its ability to handle new data types, volumes, and even streaming data. There have been at least two additional major revolutions within this age that dramatically enhanced our capability. 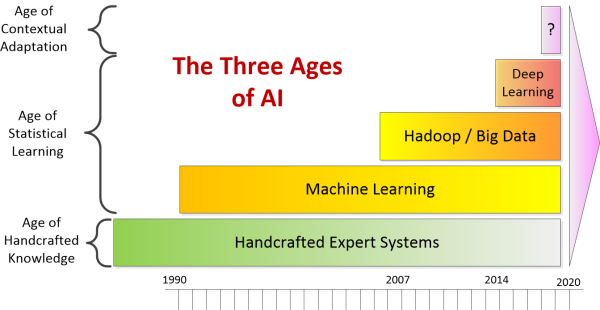 The first was Hadoop and Big Data. Now we had massive parallel processing and ways of storing and querying big, unstructured, and fast moving data sets. 2007 when Hadoop first becomes open source marks the beginning and of course it hasn’t ended yet. Generative Models: These are models that learn from underlying context, for example a learned model of the strokes needed to form each letter of the alphabet instead of brute force classification based on lots of examples of bad handwriting. Generative models which we’re experimenting with today promise to dramatically reduce the amount of training data required. In other cases like the Age of Contextual Adaptation it’s likely that we’ll have to wait for a new generation of chips that more closely mimic the human brain. These third generation neural nets called Neuromorphic or Spiking Neural Nets will utilize chips that are in the earliest stages of development today. We’ll get there, and even to the Third Age. Before we graduate from this one however, there may be other evolutions or revolutions that we haven’t anticipated. I think, “Relating” and “Prioritizing” are important characteristics as well, besides “Perceiving, Learning, Abstracting and reasoning”. And Cognitive Learning is trying to enhance the “Handcrafted Expert systems” in all domains.